The small country of Bolivia is known for its rugged geography and epic landscapes. In stark contrast to its beauty, it is also the poorest county in South America. And like many other economically depressed countries worldwide, Bolivia also has a large stray dog population. Nearly two million dogs roam the streets suffering from malnutrition and neglect. But there’s one man who is trying to put a dent in this heart-wrenching statistic. Meet Bolivia’s dog savior, 45-year-old Fernando “Ferchy” Kushner. Ferchy has made it his life’s mission to help Bolivia’s homeless dog population. In 2015, he formed the organization Alimenta Perritos de la Calle (Feeding Street Dogs), which has sterilized over 800 dogs with the help of volunteers and veterinarians. Last March I got a chance to tag along with Ferchy to meet some of the beloved street dogs he’s been helping. With two large buckets full of discarded chicken, we set off on foot to feed some of the nearly 1,000 hungry dogs he encounters each day. With the help of local restaurants, Ferchy has created a sort of table-scrap recycling program. 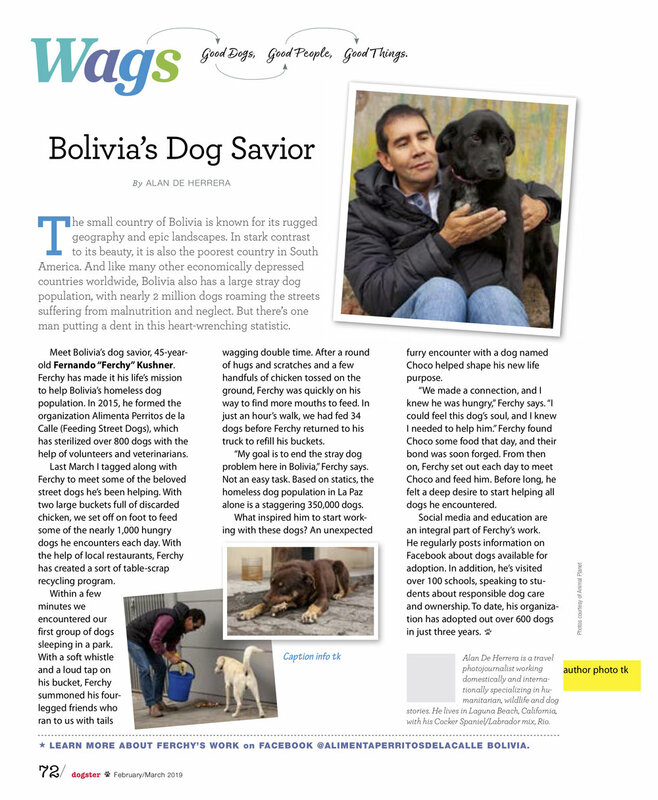 “My goal is to end the stray dog problem here in Bolivia,” said Ferchy. Not an easy task. Based on statics, the homeless dog population in La Paz alone is a staggering 350,000 dogs. I asked Ferchy what had inspired him to start working with these dogs. It turns out, an unexpected furry encounter with a dog named “Choco” helped shape his new life purpose. “We made a connection and I knew he was hungry,” said Ferchy. “I could feel this dog’s soul, and I knew I needed to help him.” Ferchy found Choco some food that day and their bond was soon forged. From then on, Ferchy set out each day to meet Choco and feed him. Before long, he felt a deep desire to start helping all dogs he encountered. Social media and education are also an integral part of Ferchy’s work. He regularly posts information on Facebook about dogs available for adoption. In addition, he’s visited over 100 schools speaking to students about responsible dog care and ownership. To date, his organization has adopted out over 600 dogs in just three years.